Good morning all hope your Wednesday is off to a great start! 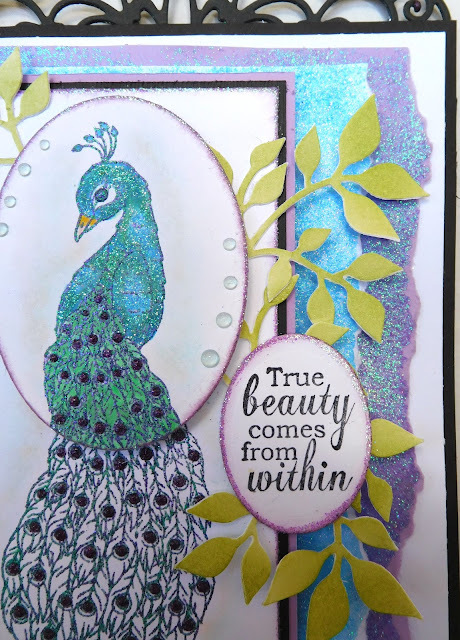 It's designer Belinda here to share a card with you using the newly released and oh so beautiful True Beauty stamp set. Let's get started! First using the new Elizabeth Die from Crafter's Companion the black layer was die cut. This created a beautiful top for my card. Small drops of Purple Rain Glitter Drops were placed on the die. Next I needed to create the background layers using Blue Topaz and Tanzanite Lavender Glimmer Paste. Covering pieces of cardstock with the glimmer paste and a craft knife. This will need to dry for serveral minutes. Once dry the edges were torn and adhered to the card base. This really created a pretty shimmer for my card background. 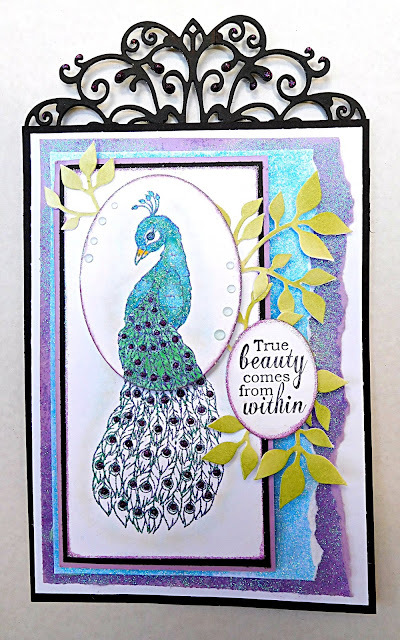 Next the beautiful peacock was stamped with versamark twice and embossed using Peacock EP. 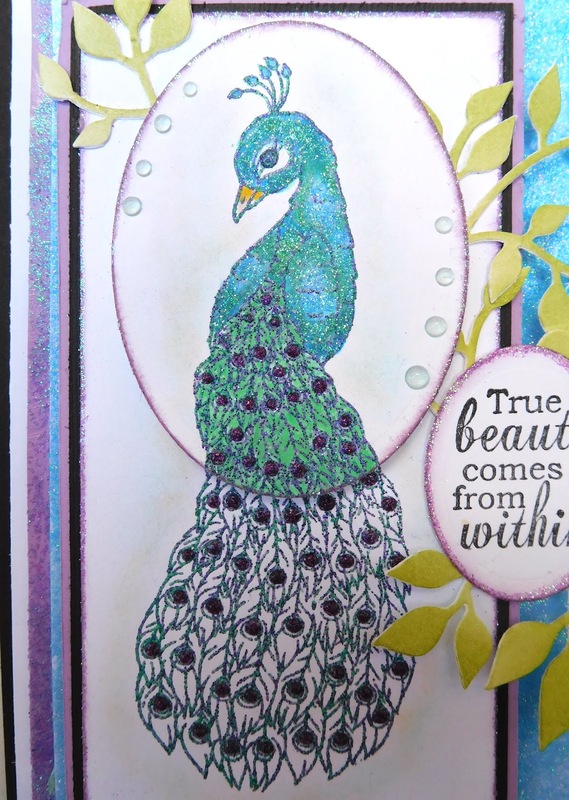 One of the image was die cut using Spellbinders Oval die and colored with copic markers. Sparkle was added using the Nuvo Small Glue Pen and Waterfall glitter. Drops of Purple Rain Glitter Drops were placed on both images. The die cut images was placed on top of the 2nd image using foam dots. Glue was added to the edges of the oval using the Nuvo Medium Glue Pen and glittered using Orchid glitter. Drops of Sea Breeze Jewel Drops were placed around the oval. The sentiment was stamped and die cut using the small oval die from Spellbinders. The edges were glittered using the Medium Glue Pen and Orchid glitter. The leaves were die cut using a Sizzix die and placed around the sentiment oval and larger oval. Thanks so much for stopping in, have a wonderful day! !